Darjeeling district magistrate Joyoshi Das Gupta has clarified that the state government is merely "reconstructing" cottages at Tiger Hill, a statement which has not convinced tourism stakeholders and the Gorkha Janmukti Morcha. Soon after the West Bengal Tourism Development Corporation started digging up Tiger Hill to construct a "Tourist Lodge at Tiger Hill" as mentioned in the signboard put up by the authorities, the tourism stakeholders and the Morcha have raised objections to the project based on environmental concerns. Tiger Hill, situated 14km from here and at an altitude of about 8000ft, falls under the Senchel Wildlife Sanctuary and the Morcha doubts if the construction was taken up with proper environmental clearances. Das Gupta, in a message she posted in the district information and cultural affairs department WhatsApp Group last evening, said: "It has come to my notice that wrong information is being circulated regarding 'construction' of so-called 'resort' at Tiger Hill." The top district official has clarified: "It is known to all residents that cottages which were already existing at Tiger Hill under the Tourism Dept, had been burnt down during agitations some years ago. The Tourism Department is merely RECONSTRUCTING cottages on the same site as part of an eco-tourism project." A bungalow called Chalet was built at Tiger Hill by the Britishers in 1916. Another structure called the Club House also existed there. But the Club House, which was part of the Tiger Hill golf course, was burnt down during the 1986 Gorkhaland agitation. The Chalet, however, still stands at the site. Asked about the details of the construction of cottages and its estimated amount, Das Gupta said the tourism department had the details. However, Sunil Agarwal, the joint director (tourism) of north Bengal had earlier told this newspaper: "It is one of the major tourism projects that we have taken up at Tiger Hill. We are building four cottages, 20 double-bedded rooms and a 20-bed dormitory. The total project cost is around Rs 40 crore and the work has already started." The Telegraph visited Tiger Hill today. Trenches have been dug up at two places to lay foundations. One of the spot is in front of the Chalet that still stands. The other spot, where mud has been dug up, is about 100m from the Chalet and there is no visible sign of reconstruction of the destroyed Club House. 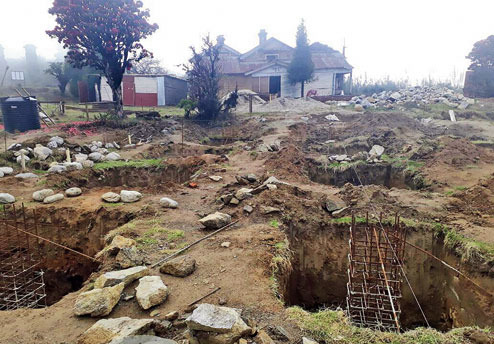 Pradip Lama, the secretary of the Darjeeling Association of Travel Agents, said: "If only two cottages are being reconstructed, why should there be protest. However, the progress of work suggests that the new multi-storied buildings are coming up at a spot which was earlier untouched. The protest is against the new constructions in the forest." Swaraj Thapa, a member of the Morcha's Study Forum, also expressed surprise over the district magistrate's clarification.